DB is proud to carry a full assortment of Caulking from ITW Polymers Sealants. ITW’s SM-7108 Polyurethane is a standard in the metal building industry and is designed for sealing exterior panel joints, windows and doors to provide a moisture and vapor barrier. DB also carries a complete inventory of ITW’s 5227 Butyl Tape, from sizes of 3/8” x 3/32” to 3/16” x 2 ½”. This highly elastic butyl rubber tape has excellent surface tack and is designed for sealing side laps in metal roofing. 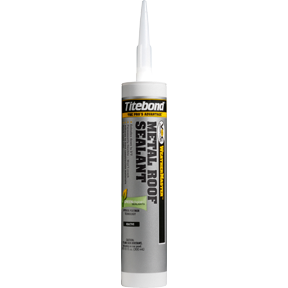 Titebond® WeatherMaster™ Metal Roof Sealant is specifically formulated to outperform all other sealant technologies, including silicones, tri-polymers, and polyurethanes. This superior polymer formula provides a waterproof seal against water, wind, dust and dirt. It offers exceptional adhesion to Kynar™ coated metal materials, along with standard metal, aluminum, steel, galvanized bonderized surfaces, plastics and glass. The product is ideal for use on a wide variety of metal roof, trim, architectural metal siding, aluminum, galvanized steel, galvanized gutters, flashing and downspouts. It also provides unbeatable adhesion to wood, brass and other common building substrates. Titebond WeatherMaster Metal Roof Sealant is available in over 50 colors, all of which match today’s popular metal roof and metal siding colors, regardless of the material or manufacturer. If touch-ups are necessary, it is paintable in one hour after application. It extrudes in extreme weather conditions (down to zero degrees Fahrenheit) and is UV-resistant, making it the ideal choice for exterior applications. It will expand and contract with the change of weather and temperature and will not crack. This sealant contains no solvents or isocyanates and is VOC-compliant.